The 22nd release on Clubsonica Records welcomes Rodrigo Kesovija to the label for his debut single. The Argentinean artist has been touted as one of his country’s most promising progressive house talents. With just 5 releases credited to his discography Rodrigo has already made a name for himself with appearances on 238W Inc. and Balkan Connection South America. Now he makes his much anticipated debut on Clubsonica Records with his latest single entitled ‘Deep Romance’ alongside remixes from Paul Deep & Martin Gardoqui, Nicolas Rada and Maxi Iborquiza. 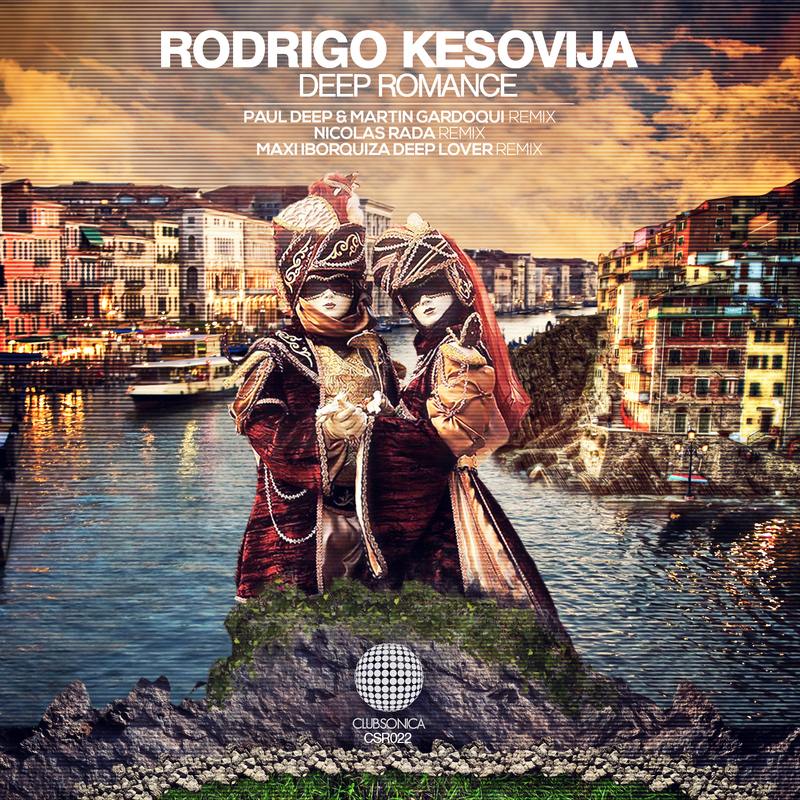 Known for having a soulful vibe about his productions Rodrigo certainly lives up to that mantra on ‘Deep Romance’. Appropriately titled, it’s deep, chunky grooves and blissful motifs are quite compelling for both the mind and feet. With a cool symphonic concept a warm wall of sub bass drops, bringing emotion through its smooth chord changes. The two minute break advances the storyboard with a shimmering backdrop and ethereal accents, eventually leading to a recollection of the elements and a gorgeous finish. Wonderful work from Rodrigo and perhaps his all time best. Hernan Cattaneo seems to think so too as the storied DJ has already showcased the track on his famed Resident Radio show. The first interpretation of ‘Deep Romance’ is provided by Paul Deep & Martin Gardoqui who are making their first appearance on Clubsonica Records. With a collective discography that includes releases on 238W Inc, Asymmetric Records, Hydrogen and Stellar Fountain the Argentinean duo have amassed a strong following in the progressive underground. Their deep, hypnotic sound has been supported by Hernan Cattaneo and they’ve delivered another superb production for their ‘Deep Romance’ interpretation. Playing nicely off the main themes Paul and Martin have brought their own progressive flair to the piece with a strong atmospheric presence. A catchy arp adds a wonderful cadence to the groove while several timely breaks up the dramatic tension, ultimately foreshadowing a serene and satisfying conclusion. A brilliant interpretation which sits as a solid complement to the deeper original. The second interpretation of ‘Deep Romance’ is provided by Nicolas Rada who is also making his first appearance on Clubsonica Records. The Argentinean artist is fresh off releases on Balkan Connection, One Of A Kind and Superordinate Music. The long-time contributor to Nicholas Van Orton’s BCSA has also earned his fare share of praise from Hernan Cattaneo and his remix of ‘Deep Romance’ looks set for a similar fate. It’s dark and brooding groove is complemented wonderfully with a vocal stab and fluttery synth elements. Eerie chimes advance the narrative as the repetitive vocal continues to build tension all through the main break, before the kick returns in moody fashion for what should be an amazing moment on the dance floor. Huge remix from Nicolas and surely one of his all time best. The release concludes by welcoming Maxi Iborquiza to the label for his first appearance. The Argentinean producer has been one of the main contributors to Jacco@Work’s LuPS Records over the years and has also appeared on 3rd Avenue, Clinique Recordings and Mistique Music. Here Maxi brings his vision to ‘Deep Romance’ with a with an aptly titled ‘Deep Lover’ interpretation. With a markedly slowed tempo and laid back vibe the Argentinean artist masterfully remoulds the original elements into a reflective, electronica piece that adds variety and depth to the project. A superb interpretation from Maxi and a fabulous way to close out another must have release from Clubsonica Records. Don’t miss it.